The sun was hanging low over the outline of the ancient temple of Preah Ko as we alighted for the last time from our tuk-tuk. 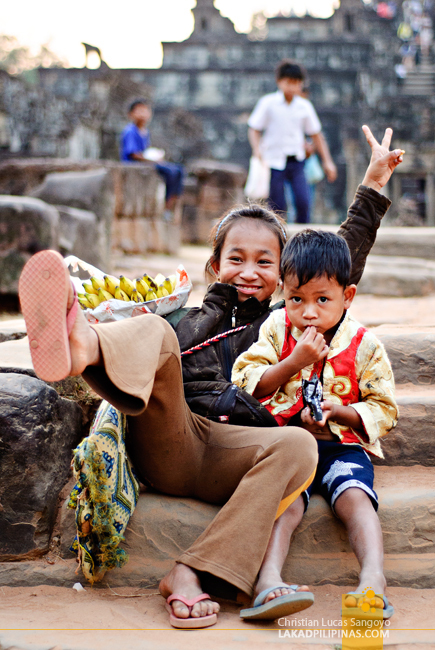 We have just visited two other temples at Roluos, a sleepy town about thirteen kilometers away from downtown Siem Reap, and we were discovering for the first time what Cambodia has to offer to tourists like us. 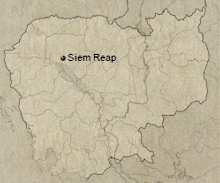 Earlier, we availed of Siem Reap’s temple pass at the APSARA (Authority for the Protection and Management of Angkor and the Region of Siem Reap). 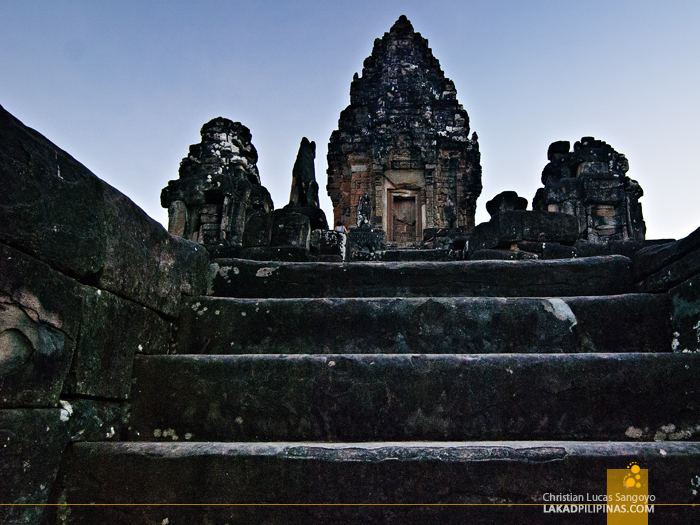 One cannot simply saunter his way off to any of Siem Reap’s temples without waving a pass to the guards in the area. They have three kinds of passes, a one-day pass (20.00 USD), three-day pass (40.00 USD) and a seven-day pass (60.00 USD). The three-day pass suited us well, since we only have four days in the country. 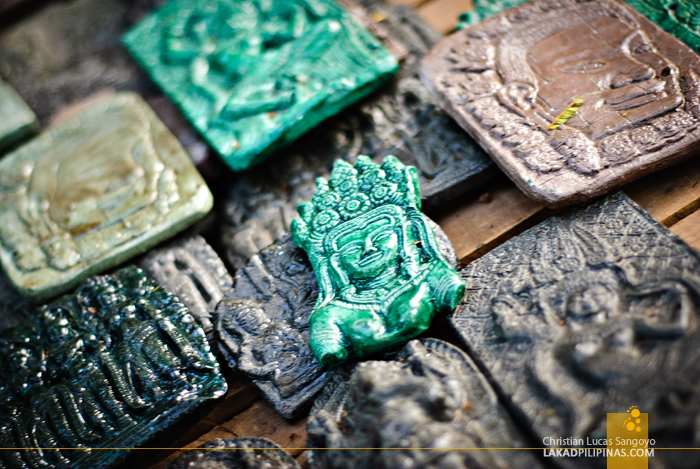 Availing one is easy enough, just hand over your money at the APSARA, they would then take a photo of you, then print out your ID. From the Happy Guesthouse in the backpacking district of Siem Reap, we availed of a tuk-tuk tour; then walah, we’re ready to start with our temple journey. 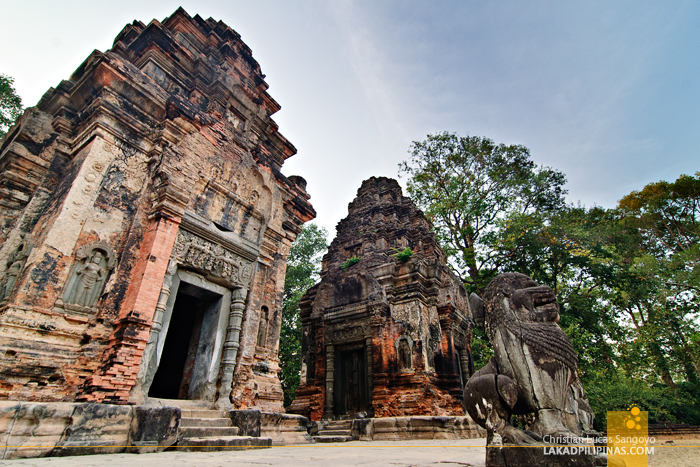 The Roluos Group are composed of three temples; Prasat Lolei, Preah Ko and Prasat Bakong. 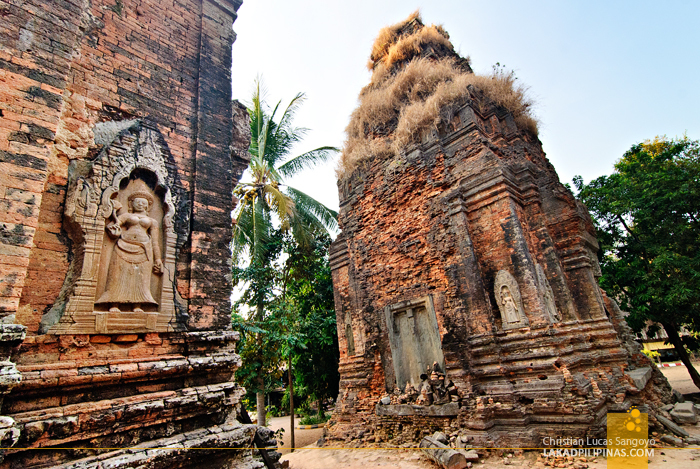 Built during the late 9th century in the old city of Hariharalaya (now Roluos), the former capital of the first Khmer Empire, these are some of the oldest Hindu temples in Siem Reap. A few of its parts have been reconstructed by French architect and archeologist, Maurice Glaize, during the 1930’s using the anastylosis method. It’s a process where one uses as much of the original materials and method in restoring a period structure. These group of temples are quite small compared to the other temples in the area and can be explored in about three hours to half a day. 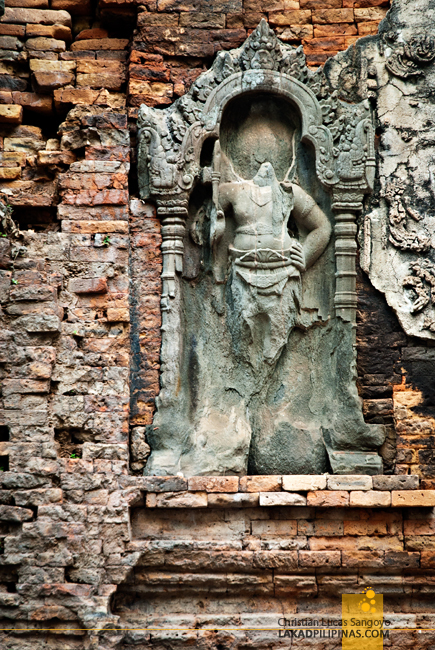 Prasat, from the Sanskrit word prasada, means temple or castle. 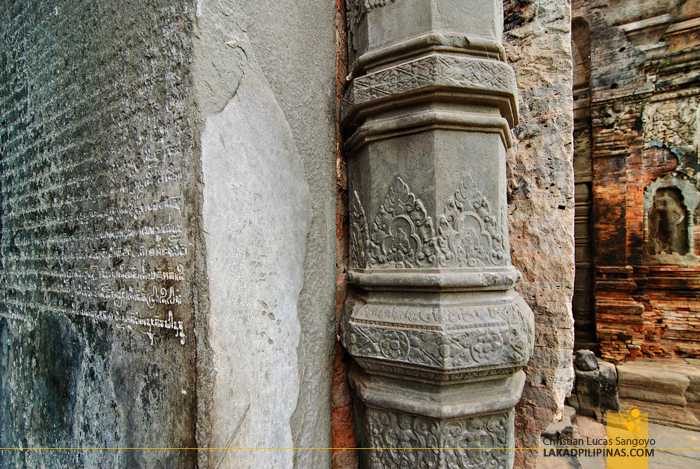 I can definitely see that for Prasat Lolei, it denotes the former. 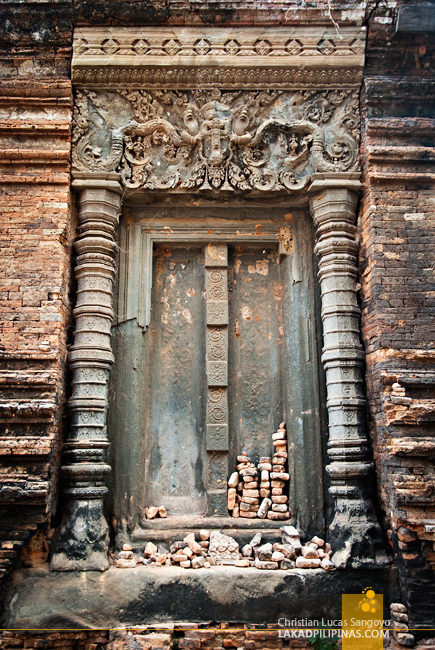 This is the first temple we visited in Siem Reap and is the smallest in terms of size and grandeur. The temple is in a real state of disrepair, but from the outset, we can see that work to have it restored is being undertaken. Up to what extent, I have no idea, as a few parts are literally smashed to high heavens. 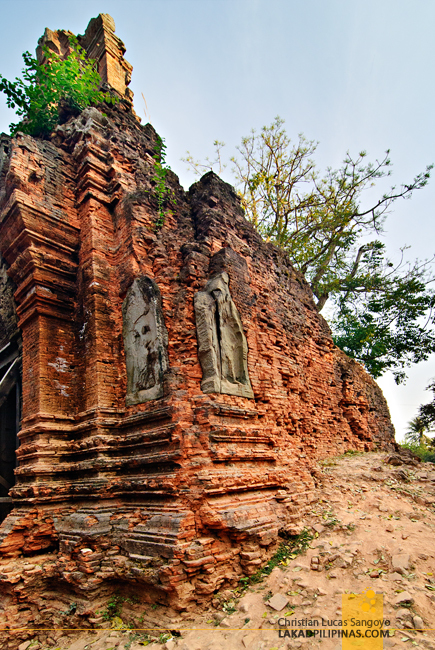 Prasat Lolei sits on a terrace, which seemed to be partly buried on the ground and is composed of four small brick towers. The original structure used to be walled in and surrounded by water, an island temple, but those too are gone. 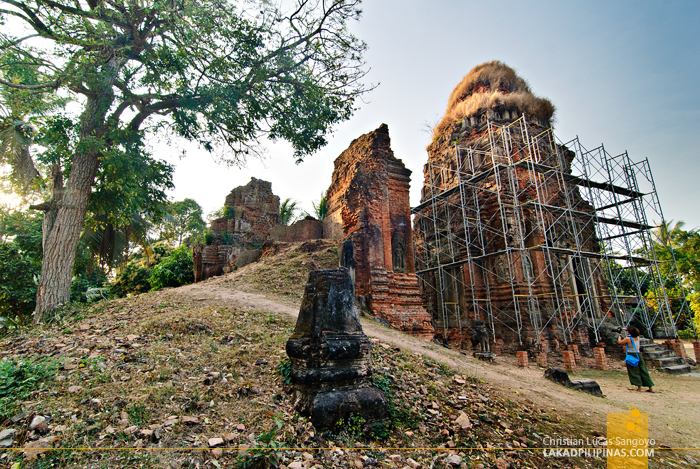 Built by Khmer King Yasovarman in 893 A.D., the four towers were dedicated to his mother, father, grandmother and grandfather. This is the last of the three temples to be built around Roluos. Even with its diminutive size, the details at this temple are amazing. The ruins sit right beside a monastery. And while we have the place all to ourselves, we could see a few orange-robed monks roaming around the area, a few of them lighting up cigarettes along the way. I didn’t know these guys were allowed to smoke, lol. 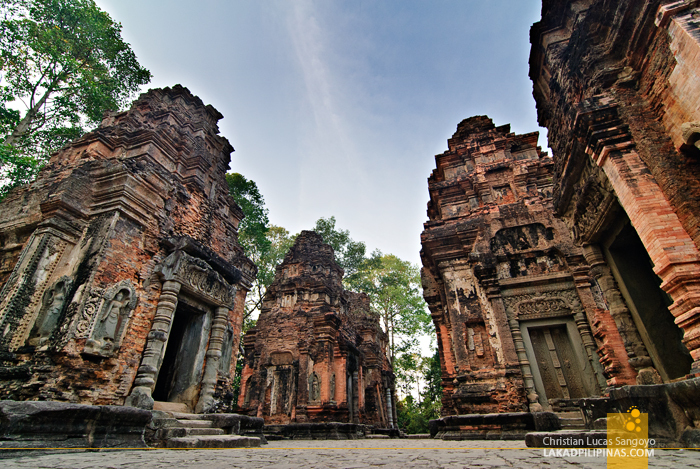 A few minutes away from Prasat Lolei is the Phreah Ko temple, the oldest structure in the Roluos temple group. Phrea Ko literally means Sacred Bull. And those bulls, which are said to represent Shiva’s servant Nandi, can clearly be seen from its front terrace, seemingly guarding the temple from the outside. 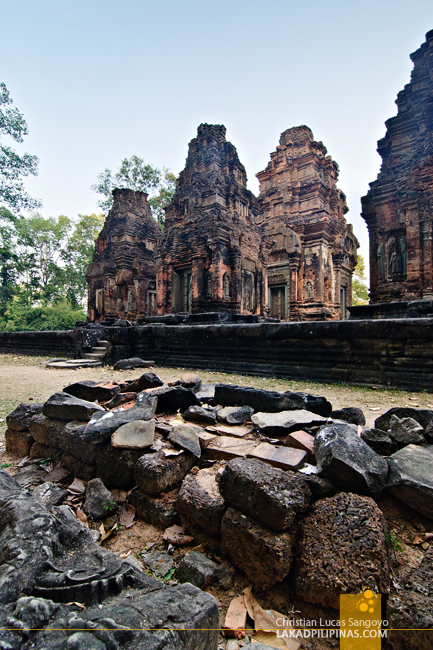 This temple complex has six small brick structures arranged in two rows of three, similar to those in Prasat Lolei, only more preserved. 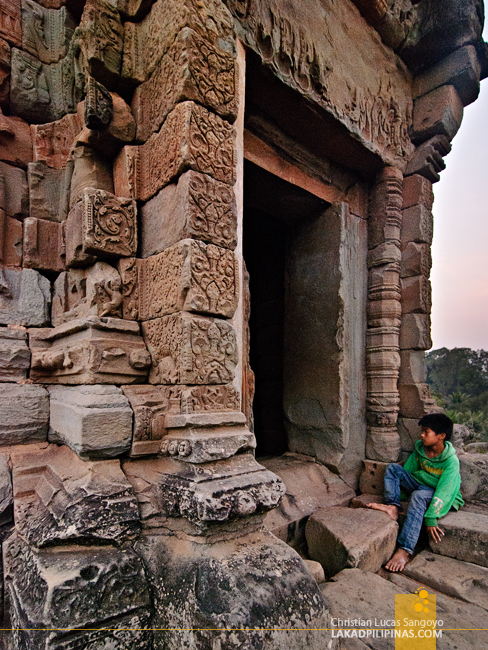 It sits on an elevated sandstone platform and was made by Khmer King Indravarman I in 879 A.D. 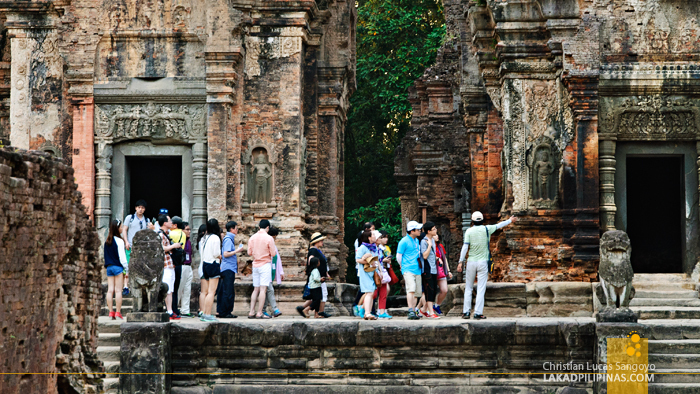 The front towers are dedicated to the king’s forefathers while those at the back are for their wives. From above, the structure seems to be just six small dots on a large square parcel of land. I later found out that there used to be a 500-meter moat surrounding all sides of the complex, which are now dry. These six towers are only a part of a larger site. While we had the previous temple to ourselves, Preah Ko seems a bit more popular with tourist as we found a group being herded by a guide. I was quite keen on what he was saying about the temple, since we really have no idea what this was for at the time, unfortunately he’s speaking in a foreign tongue. Tough luck. 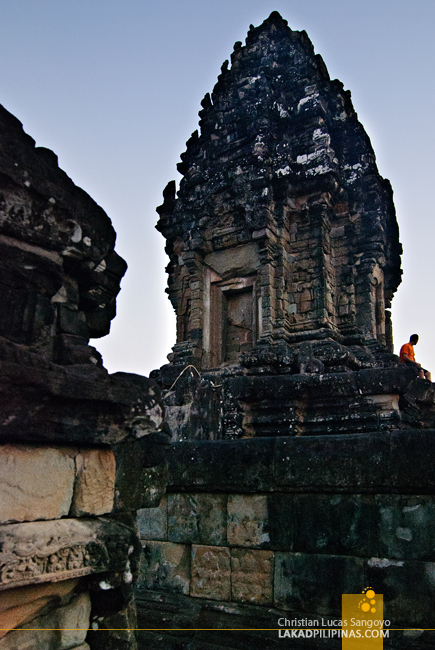 Our last temple for our first day of temple-hopping in Siem Reap’s Roluos area is definitely not the least. 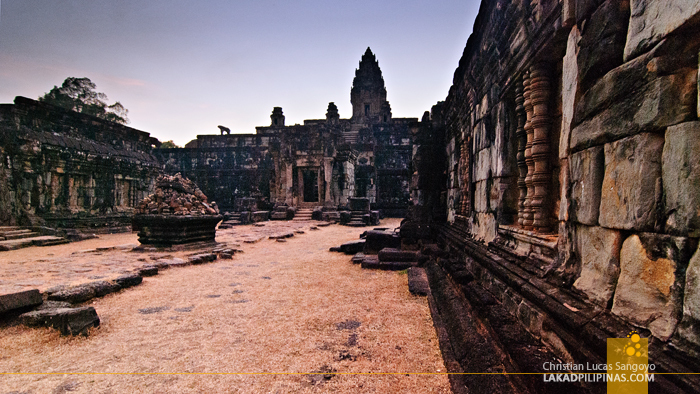 Prasat Bakong or simply Bakong, is the largest of the three temples in the area. It is most certainly its grandest. 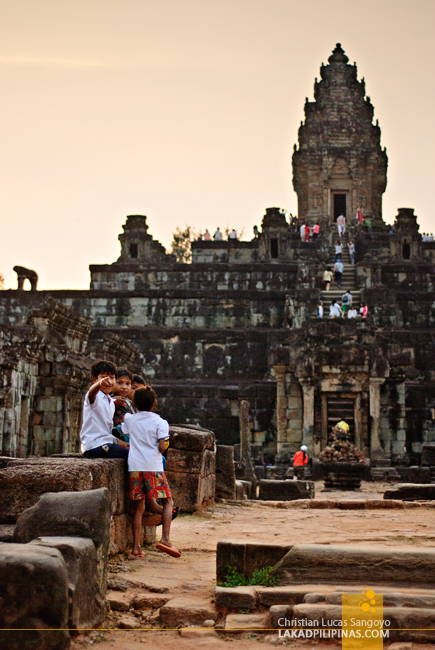 Built by King Indravarman I (the same guy who did the previous temple) from sandstone during 881 A.D., it is the first temple mountain in Angkor made by the Khmer Empire. It is built to resemble Mount Meru, Hindu mythology’s sacred mountain, and is enclosed by two moats and three concentric enclosures. Its features have been likened to Java, Indonesia’s Borubodur, and it was said that it may just be Bakong’s prototype. It is speculated that its walls must have once been covered with orante and intricate bas reliefs, which are now gone with the passing of time. On our way inside, a kid peddling bananas greeted us with the usual line of where are you from? While this usually irks most tourists, we obliged the kid instead of telling her off. We made small talk with her and a couple of her friends and found that she was quite smart! She told us that she sells bananas to help out her mother, whom we met later outside the temple, right after school. I think most tourists would enjoy a place more using this route, instead of shooing these kids and feeling pestered. Together, we climbed Bakong’s five levels, all the way to its pinnacle. All the while, chattering away with these kids, who were quite curious as to what the Philippines is like. While it isn’t really that high, climbing this stepped pyramid can be quite a challenge. Each steps were seemed to be made for giants! 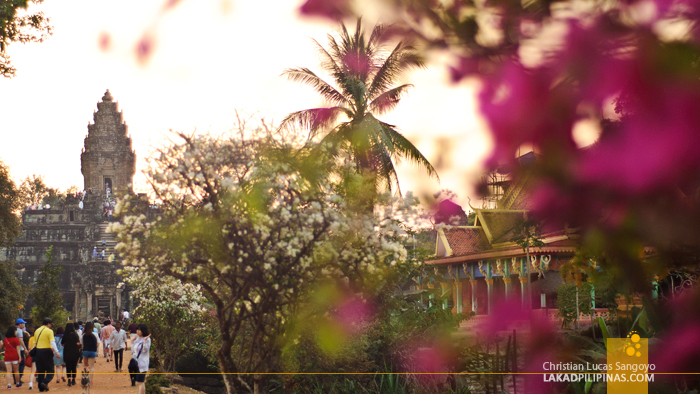 We reached the zenith just as the sun finally delivered its last burst of golden light. The giant disc slowly slid down the horizon and twilight descended upon the land. We gazed through the surrounding area as the sky deepened to electric blue. From the pyramid’s apex, I can see a vast plain covered in lush trees. I know there are more temples hiding among these. This is just the start, we’ve got two more days to go.